Hello Loves. 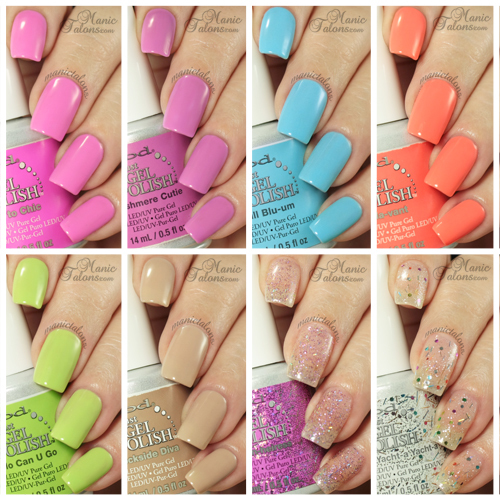 I have the full IBD Just Gel Social Lights collection to show you today. The Social Lights Collection is made up of 6 light creams and 2 glitter toppers. You may remember that I wasn't 100% blown away with the last IBD Just Gel Collection (Haute Frosts), but I can honestly say that IBD has redeemed themselves in my opinion with the Social Lights! I didn't have any of the application or curing issues with this collection that I experienced with the Haute Frosts. With that said, onto the swatches! Chic to Chic is a muted, yet still somewhat bright bubblegum pink cream. Application was nice, though I did find this one needed three coats to be fully opaque. Cashmere Cutie is a soft, purple cream. Application was nice with this one as well. Two coats were sufficient, but I swatched three as usual for consistency. Excuse the strange shadow at the top of the index nail. I have no clue what happened there. Photography blooper, I guess. Full Blu-um is a blue cream. This one is a bit brighter than I was expecting for this collection, but I is a gorgeous shade that I will likely wear often. I do love my blues! Application was nice, but I felt this one needed three coats for full opacity as well. I should probably note that my coats are on the thin side, so if you tend to apply thicker than I do, two coats will likely suffice. Gala-vant is a bright coral orange cream that reminds me of Gelaze Flip Flop Fantasy. Definitely a nice color for summer - especially if your skin isn't translucent like mine. ;) This one was a bit tricky to apply, as I find is common with gels of this color. The third coat was certainly needed for a streak free appearance. Polo Can U Go is a muted lime green cream. This one applied nicely and is opaque in two coats. Again, I am showing three here for consistency. This is my least favorite of the creams in this collection - for no reason other than it doesn't work well with my skin tone. It is a gorgeous shade. Shame my skin tone doesn't agree. Dockside Diva is a gorgeous taupe cream. This one surprised me most out of the entire collection. I wasn't expecting to like it as most taupe gels do not compliment my skin tone, but I feel I can wear this one with ease. Application was nice. It can be worn in one or two coats for a sheer look or three coats (as I have swatched it here) for an opaque finish. Now for the glitters. Billion-heiress has a mix of fine pink glitter and holographic strips in a clear base. I'm not sure why IBD is so hung up on strip glitter lately, but I'm honestly not in love with it. I find that it is difficult to apply without all of the strips lining up. I had to do a little bit of glitter positioning. This is three coats. Below is one coat of Billion-heiress layered over Cashmere Cutie. Again, I had to position those strip glitters to keep them from lining up on the nail. The final gel in the Social Lights collection is Yacht-a Yacht-a Yacht-a. This is a gorgeous, silver shimmer in a clear base with multi-colored hex glitters and multicolored strips. Of the two glitters, I like this one best because it is much more versatile. Application was tricky with this one as well. The shimmer in the base applied nicely, but I had a hard time getting the larger glitter pieces off of the brush. I ended up having to dab them on. Below is one coat of Yacht-a Yacht-a Yachta layered over Full Blu-um. You can see how the strips started lining up in this photo. Since I had to fight with the hexes, I didn't bother to rearrange the strips. Do you have a favorite from this collection? I'm personally torn between Dockside Diva and Gala-vant! *This post uses Amazon and Ebay Affiliate links. Purchases through these links generate commissions that help fund this site. Thank you so much, Michelle, I was really waiting for these swatches! I am looking for a light pink or bubblegum creme. One that does not fade, of course. Do you have a recommendation or two? Thank you so much for these swatches. I've been waiting for them and I am definitely tempted by full blu-um. Thanks again! Thanks so much for these Michelle, I've been hanging out to see them!! How does "Chic to Chic" compare to "Funny Bone" and "Cashmere Cutie" to "My Babe" ? These are great! Thanks for doing so many swatches for us! Any chance you could compare full blu-um to some other blues for me? I have a lot of those now and an trying not to duplicate! I'm debating between CG Flip Flop Fantasy and IBD Gala Vant.. which do you prefer and what are the differences? Thanks!